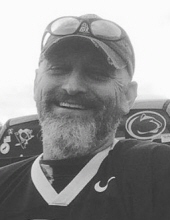 Michael P. Eddy, age 56, of Holbrook, PA, passed away on Tuesday, October 30, 2018. Born July 7, 1962 in Waynesburg, PA, he is the son of the late Robert Curtis Eddy and Janice Dawn (Lemley) Eddy, of Pine Bank, PA.
Michael was a Greene County resident all his life. He graduated from West Greene High School in 1980. Michael worked for Ironworkers Local Union #549 as a second-generation Ironworker for 31 years until he retired in 2010. He was a member of the Waynesburg Moose Lodge #461. Michael was an avid rifle and bow hunter. He enjoyed riding motorcycles, watching Penn State football, wood working and making furniture. Michael loved spending time with family, friends and his favorite companion, his rottweiler, Ted. In addition to his mother, he is survived by his wife, Eldora C. Daniels Eddy; two children, Robert M. (Tiffany) Eddy, of Mt. Morris, PA, and Jennifer R. (George) Jr. Ingram, of Washington, PA; Lisa Ann King, mother of Michael’s children; four grandchildren, Laney Ely, Colton Hillberry, Annabelle Eddy and Tessa Eddy; two sisters, Debbie Hull, of Waynesburg, PA, and Brenda (Bill) Houser, of Pine Bank, PA; nieces, nephews and cousins. He was preceded in death by, one sister, Marcia Jo Blair. Friends will be received on Sunday, November 4, 2018 from 6-8 PM at the Kesterson-Rush Funeral Home, LLC., 3275 W. Roy Furman Hwy., Rogersville, PA 15359. Phone: (724) 499-5181. A funeral service will immediately follow at the funeral home at 8:00 PM with Pastor Jacob Judy and Pastor Ed Hanley, co-officiating. In lieu of flowers, memorial contributions may be made to the Kesterson- Rush Funeral Home, LLC., PO Box 434, Rogersville, PA 15359. To send flowers or a remembrance gift to the family of Michael P. Eddy, please visit our Tribute Store. "Email Address" would like to share the life celebration of Michael P. Eddy. Click on the "link" to go to share a favorite memory or leave a condolence message for the family.